Barça traveled away to face Villarreal who are struggling for survival as they try to avoid relegation. It seemed like Barça were going to be enjoying an easy win with the likes of Messi, Pique and Rakitic starting on the bench when Coutinho scored in the 12th minute before Malcom scored his first league goal four minutes later to make it 2-0. However, Villarreal pulled one back in the 22nd minute through Samu Chukwuece. Four minutes after the restart, Villarreal made it 2-2 through Ekambi. The Blaugrana struggled to overcome that setback and their night got worse when Iborra scored after the hour mark and it looked bleak when Bacca scored in the 79th minute to make it 4-2 for the home side. Messi had been brought on in the 60th minute, but his impact was felt after Álvaro was sent off in the 86th for his second booking. Messi scored a 90-th minute free-kick to make it 4-3 and restore faith in his teammates of possibly salvaging a draw with 3 minutes of stoppage time left. 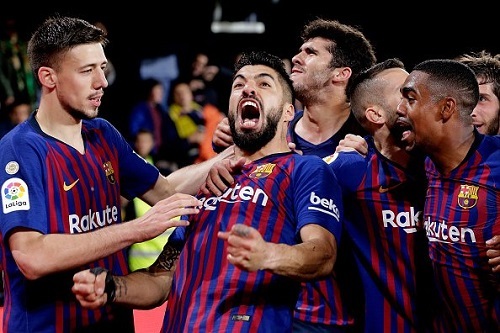 The Blaugrana stunned the Yellow Submarines players and their fans when Suárez volleyed the equalizer deep into stoppage tie to make it 4-4. Barça players will have a few days to celebrate their comeback draw before next weekend’s showdown against second place Atletico Madrid with the Blaugrana enjoying an eight-point cushion where a victory will more or less ensure a firm grip on the league crown. Villarreal CF: Asenjo, Gaspar, Álvaro, Funes Mori, Víctor Ruiz, Pedraza, Morlanes (Cáseres 63′), Iborra, Samu Chukwuece (Bonera 88′), Cazorla, & Ekambi (Bacca 74′). FC Barcelona: Ter Stegen, Sergi Roberto, Umtiti, Lenglet, Jordi Alba, Busquets (Aleñá 73′), Arthur (Rakitic 73′), Arturo Vidal, Coutinho (Messi 60′), Suárez & Malcom. Goals: 0-1, Coutinho (min.12); 0-2, Malcom (min.16); 1-2, Chukwuece (min.22); 2-2, Ekambi (min.49); 3-2, Iborra (min.61); 4-2, Bacca (min.79); 4-3, Messi (min.90); 4-4, Luis Suárez (min.90+3). Red Cards: Álvaro (min. 86). Previous PostBarça victorious in the Derbi barceloní with a 2-0 win over Espanyol. Next PostBarça has one hand on league trophy after 2-0 victory over Atletico Madrid.